We are currently working on the next incarnation of our software and hardware platform for vehicles controlled over the Internet. Among others, we decide to investigate the way to control our robot without micro-controllers. In fact, BeagleBoard has a lot of GPIOs available. In addition, three hardware PWM generators and I2C bus should be enough at least to control the tank with camera, compass, GPS, and sonar. We believe that BeagleBoard is also powerful enough to accomplish all these tasks (including DSP-based real time video encoding) without additional micro controllers.If this claim is true, than it could be an advantage from the price, space and complexity point of view. 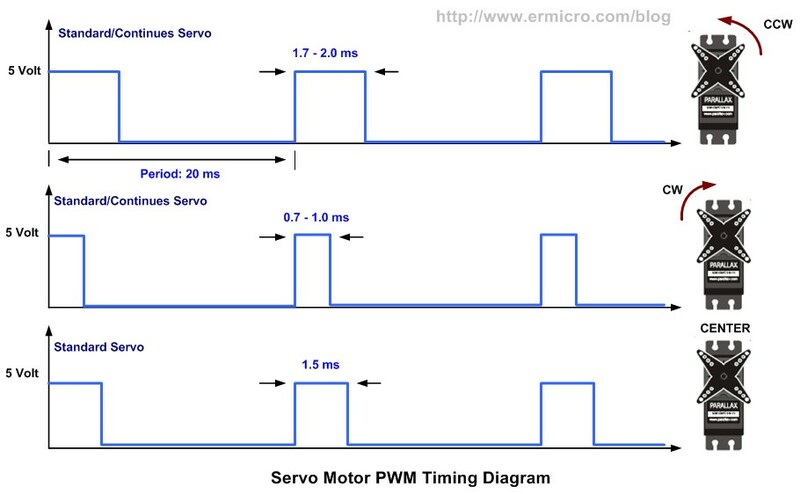 Pulses has 20ms distance (50Hz) and servo position is encoded by the pulse width with ~0.7ms to ~2.0ms meaning left and right most positions respectively (actual values typically vary a little depending on the servo model and vendor). From the hardware point of view, level shifting is necessary because GPIO pins on BeagleBoard have 1.8V output but we need 5V to control the servo. For these purposes we used TI's TXS0108E voltage-level translator with corresponding SSOP to DIP adapter (a little bit difficult to solder but is doable if you did not drink a lot of bear the day before :-) ). Pins on the output connector on BeagleBoard can be configured to play different roles. This configuration process is called PinMuxing. For me personally it was and still a little bit confusing where and how to do it. There are in general three places where you can do it: in u-boot, in kernel and in your application with direct memory access over /dev/mem. The first two ways will give you file system interface with /sys/class/gpio/gpio* entries in file system. Standard read() and write() functions could be used with these files to control GPIO direction and output. The third way will require to map the physical memory using /dev/mem and then read/write to special addresses to control the output of the GPIO pin. To make it work properly, the kernel config option CONFIG_OMAP_RESET_CLOCKS, which is enabled in the default BeagleBoard defconfigs (and is also enabled in the kernel used by Angstrom distribution we are using) should be switched off. This is a kernel power saving feature and somehow it leads to the kernel oops in this scenario. This loop can be actually implemented even as a shell script. As an alternative, it is possible to use read() and write() function in C to implement set_gpio_output_to_high() and set_gpio_output_to_low(). What is important however, is to ensure that the pulse width remains exactly the same as long as you want the servo to stay in certain position. This is the place where the problem arise - Linux is not a real-time system and that is why there is no guarantee that sleep() function will return exactly after requested amount of time. Context switching between kernel and user space (as happens when using kernel functions such as read() and write()) may also add to the unpredictable timing. As a result the servos will become "nervous". They will shake periodically instead of staying in the desired position. Unpredictable delays caused by context switching between kernel and user space. Here we replace the call to write() kernel function with direct memory access to trigger GPIO158. This solution should solve the problem with undeterministic timing resulted by context switching. So let us see what we can achieve with this implementation. To make this post not so boring, instead of showing typical oscilloscope measurements, we decide to place a video of our current testing vehicle where the video camera is mounted on the servo we are controlling with our PWM generation application. The following video fragment illustrates the servo behavior when running the PWM generation with direct memory writes. No other load was put on the system (~99% system idle). Initially, the servo is turned away from the camera. After a couple of seconds, we run the test application which rotates the servo towards the camera to illustrate that we are actually controlling the servo. What can be clearly observed is that servo is shaking. In addition, there is a typical noise from the servo could be heard which is also a sign that the position is constantly changing. The situation become much worth if we put considerable load on the system. In this case we run another process in background which creates about 98% system load (~1% system idle shown by top). In fact, those results were easy to predict. It is also obvious that, the version with write() function (not speaking about corresponding shell script) would show even worth results. That is why we decide even not to test this configuration. So now it becomes clear that we need deterministic sleep() function behavior to achieve stable servo positioning. There are two options we were consideing: PREEMPT_RT kernel patches and Xenomai. Speeking about preempt_rt, we did not manage to find such configuration of the Linux kernel used by Angstrom/OpenEmbedded which works on BeagleBoard and has preempt_rt patches for it. Installing Xenomai was also not a straightforward task. There were problems applying patch to the kernel we were using. However, we were able to solve them. In addition, according to our understanding, Xenomai is considered as "more real-time" then preempt_rt because it runs whole Linux kernel as one of it's task in parallel with other real-time tasks and can preempt it almost at any point if necessary. So we decide to continue our experiments with Xenomai. At the time of writing, we were using kernel version 2.6.35.9 with Xenomai version 2.5.6. Test results were much better! Actually, without system load, servos controlled by Xenomai application was perfectly stable. That is why there is no video for this case - there is nothing to see :-) because servo just remains at the defined position. No shaking, no noise. Nevertheless, this behavior is better then the one without Xenomai and in fact the best we were able to achieve so far. According to our (non formal) observations, what is typically causing increasing shaking is extensive console IO (connected with SSH over the USB WLan adapter on the BeagleBoard) or in general network activity. Running the Xenomai's latency application in parallel with our test program reveals the latency of around 40 microseconds. Based on what we read in Internet, 40 microseconds is considered "normal/OK" latency for Linux/Xenomai running on ARM at 600MHz. Taking in account typical pulse width of about 1 millisecond, 40 microseconds is about 4%. Is this 4% in fact what we actually see on the video? If yes, does it mean that even with Xenomai it is not possible to control servos reliably even under moderate system load?! We would really appreciate any feedback if someone familiar with the matter can provide some thoughts about the way to improve the situation. We are somehow do not want to accept the fact that Linux running on such a powerful system such as BeagleBoard can not be enough real-time to generate 1-2ms wide pulses at 50Hz with latency considerably less then 40us? We are really hope that there are some tweaks can be made to achieve much better real-time performance. Our whole software (including Xenomai-based control module) is open-source and available online here. The relevant Xenomai-based servo control sources could be found here. The whole source code repository contains the OE layer for Angstrom to generate image with all patches and dependencies to run our on-board software. This software, among others, illustrates how to control servo motors with direct memory access and Xenomai, how to communicate over I2C not using Linux kernel (for better real-time), how to work with I2C sensors such as compass and sonar, how to receive location from GPS sensor, how to compress video in real-time using DSP-enabled codecs with Gstreamer, how to send video and other sensor data over the network in real-time and much more. At the client (driver) side we are using OpenGL and high performance GLSL-based rendering to display 3D driver console with live video applied as a texture to the defined surface, displaying map for received GPS position in real-time using openstreetmap.org and much more. We are currently working hard on documenting all the software and hardware we have made so far. There is already some documentation for the project available here and here. We would be very glad to receive any comments regarding question about Linux/Xenomai real-time performance stated in this post above, our project in general and of course, contributions are also very welcome. Generating PWM is a hard task not adequate for software solutions, this is the reason why most microcontrollers include specific hardware for this task. This is more evident on complex SOCs like the Cortex-A8 with MMU and other complexities. I don't know if the OMAP includes dedicated hardware for generating PWM, if not, the adequate solution for generating PWM is using external PWM generators, may be dedicated IC (Allegro has excellent candidates http://www.allegromicro.com/en/ ) or a dedicated microcontroller (PIC, Atmel, Arduino, ... ), this is the solution that I use for this kind of problems: http://www.disca.upv.es/aperles/CheapDAQ/CheapDAQ.html (10 $). So I think you can't avoid external hardware/microcontrollers, this is the actual approach. For really complex systems, I like Cypress PSOC (8051 and Cortex-M3) and Actel Smart Fusion (Cortex-M3 + FPGA). This can discharge the A8. This is the natural evolution on next generation microcontrollers, for example, NXP is trying to develop a Cortex-M4+Cortex-M0 solution. Is your Xenomai RT task in kernel or user-space? The Xenomai task was in user-space. Now I am in process to write RTDM Xenomai driver to see if it will perform better. You were writing "Generating PWM is a hard task not adequate for software solutions". I can not 100% agree with it. It probably depends on the required PWM frequency and the way the software itself is written. What I mean is if the frequency is not high (and standard RC 50Hz is not high) and the software offers useful interfaces - then why not to use it also? Regarding hardware PWM generators on OMAP - yes there are three available and we are using two of them to control DC motors. The experiment with software-generated PWMs described in this article was mainly done to collect experience and see which real-time performance (quality of the signal) we can reach with it. Thank you Михаил for the comment!